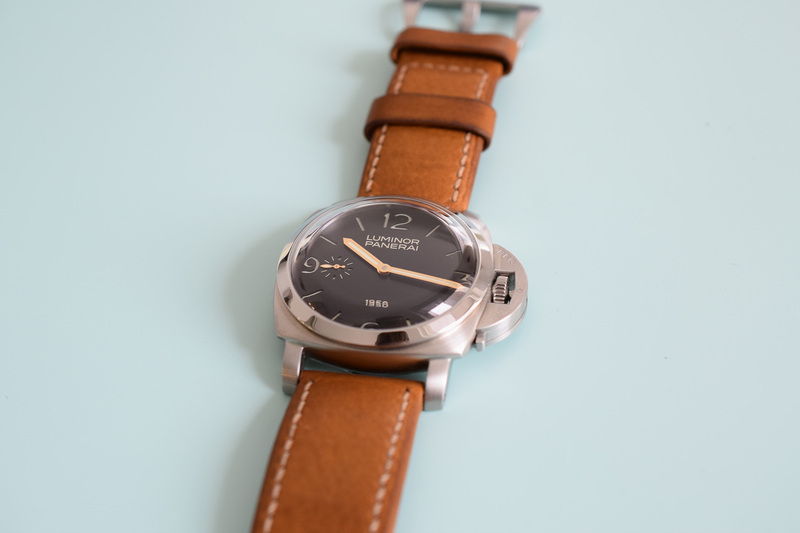 If you’ve ever met a real Panerai fan – or a paneristi, as they generally like to be known – then you already know they are some of the most passionate collectors out there. 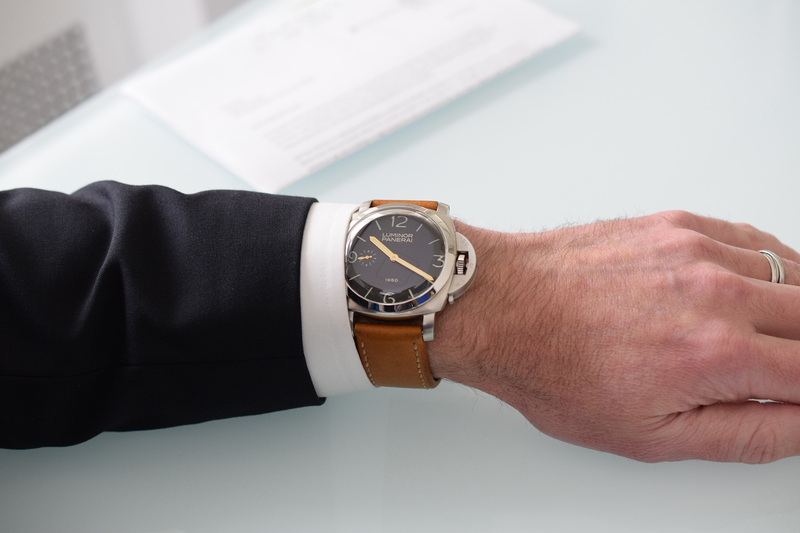 Even by luxury watch standards it’s a phenomenon that is difficult to explain; heavily attended collector meet-ups occur on a regular basis (especially in the US) and entire online communities have sprung up devoted entirely to discussing all things Panerai. 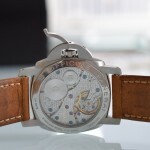 What is perhaps most surprising – well, for me at least – is that despite the brand’s relatively short history many of its watches have already achieved cult status amongst collectors. This is partly attributable to the fact that the brand adopted the strategy early on of releasing a few ‘Special Edition’ pieces each year that would have limited production runs, thus increasing their desirability among the devoted. 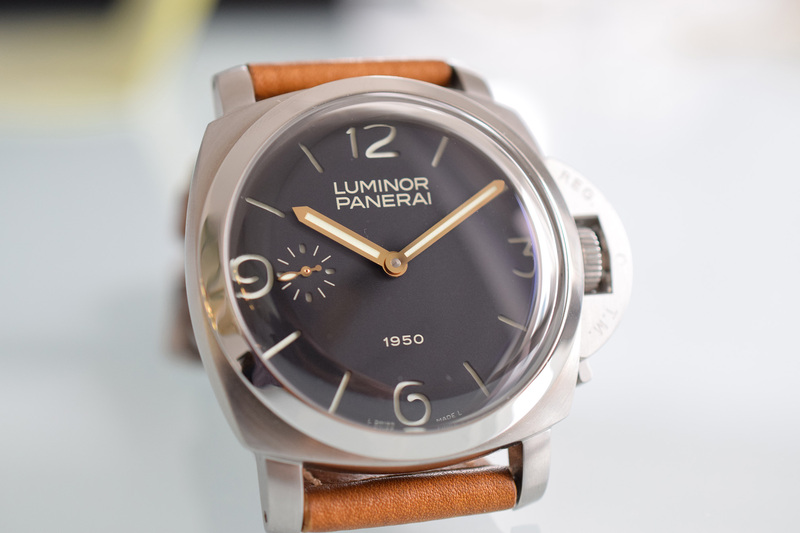 One such example is the Panerai Luminor 1950 PAM 127, more commonly known amongst enthusiasts as the “Fiddy”. Unveiled in 2002 at the Salon International de la Haute Horlogerie, the special edition PAM 127 was a hit with paneristi right from the get go, the various online forums lighting up with praise from around the world for the new, nostalgia-inducing timekeeper. 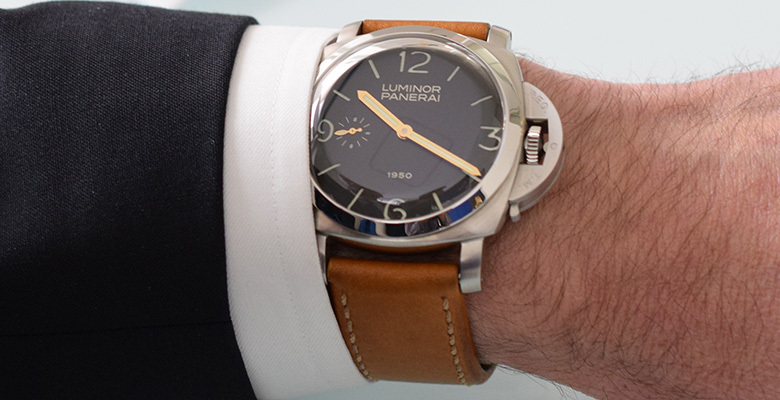 Tracing its lineage all the way back to a Panerai watch design from 1950 – hence the name – the PAM 127 embodies everything Panerai has become known and loved for; namely oversized cases, clean dials and a certain stylish yet rugged aesthetic. Ironically though, the original incarnation was never actually produced commercially. 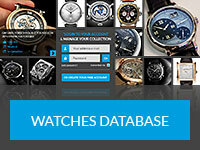 In fact none of the watches developed by the original Panerai company at this time were, rather they made exclusively for military use, specifically the Royal Italian Navy, hence the reason they were so much bigger and, dare I say, coarser than the more mainstream offerings of the time. The reason for this is fairly simple; up until the early 1990’s Panerai in its current form as a commercial watch manufacturer did not exist. 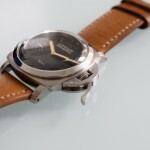 I won’t go into all the details here of Panerai’s storied past (although if you are interested in learning more I would recommend this excellent post on Jake’s Rolex World) however suffice to say that this particular design is significant because it represented the introduction of the Luminor case in 1950, completing the evolution from the Radiomir case created and refined by the company in the 1940’s. 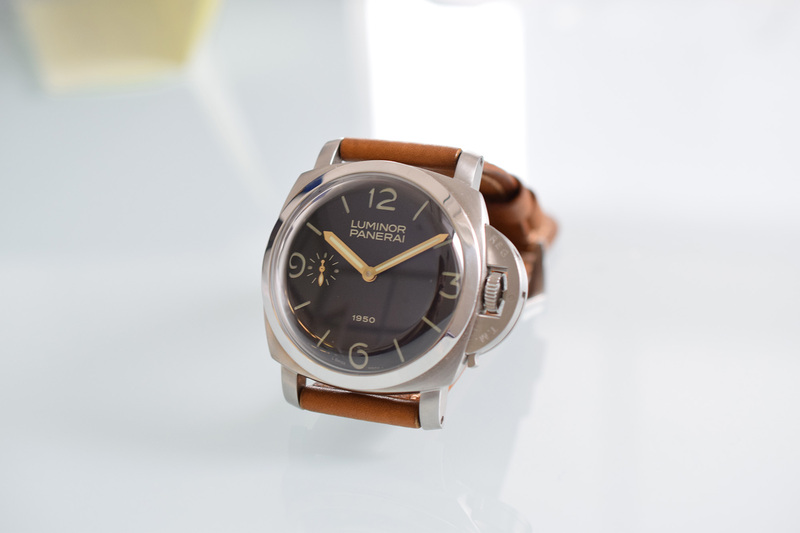 Arguably the more recognizable of the two modern-day Panerai case styles, the Luminor was clearly designed with divers in mind. Although the Second World War had now ended, the Florentine company continued the technical research begun at the start of the war when it was creating diving watches for members of the Italian Navy, culminating in the development of the Luminor. 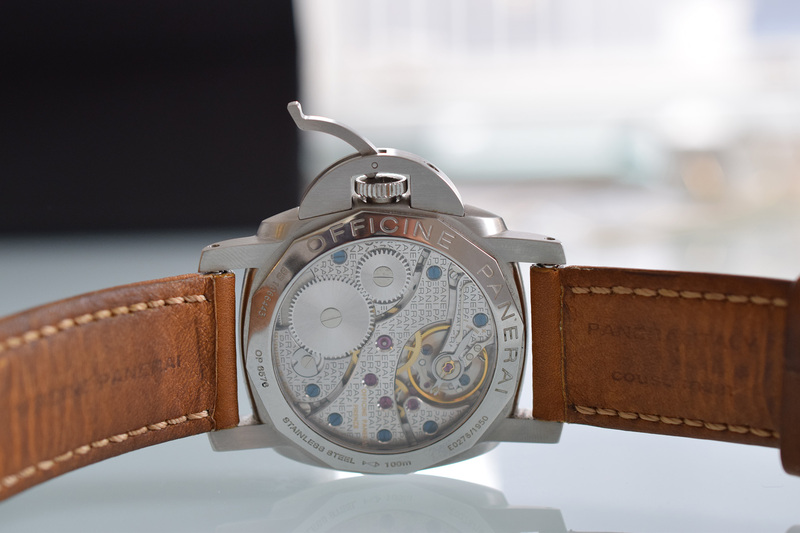 This new case was characterized by the crown-protecting bridge, with reinforced wire lugs created from the same block of steel as the case, a cushion-shaped case like its predecessor the Radiomir 1940 and a flat, wider bezel. 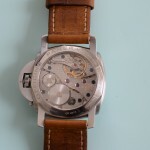 Interestingly though, the half-moon crown guard mechanism developed in conjunction with Rolex which is now synonymous with the Luminor case actually first made its appearance on a Radiomir case in around 1946 (on the Ref 6152/1), although it seems it didn’t become standard issue until the introduction of the Luminor case in 1950. 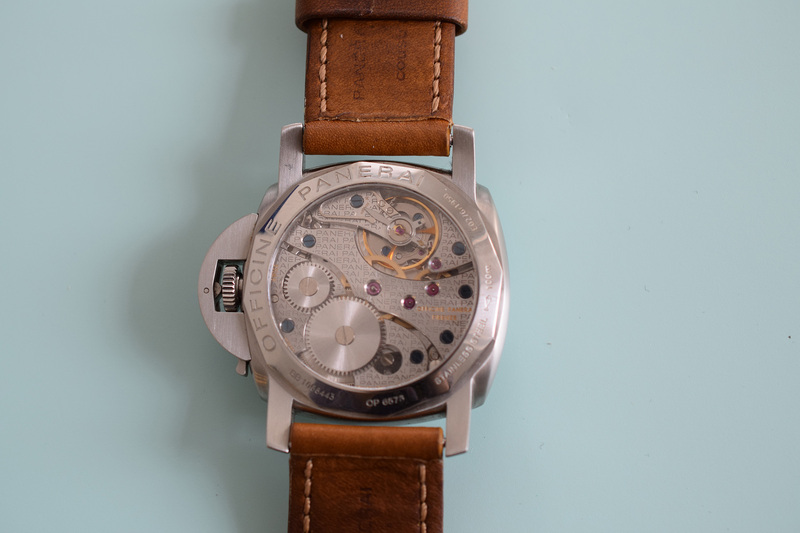 The reasoning for the crown guard was fairly simple; according to the aforementioned article on Jake’s Rolex World, all the Rolex made Panerai watches were manually wound and thus the waterproof crown gasket would wear out quickly over time. A solution was needed and so together the two companies came up with this design enhancement, which presumably was quite effective as it has been included in every Luminor case since. All this is very fascinating of course but I’m sure right about now you’re probably thinking “when is he going to talk about the actual watch?” Well, the answer to that question is now. Although I wouldn’t go as far as to call the PAM 127 a ‘grail watch’ (although I’m sure there are plenty of collectors out there who would love to have one in the vault) it is undoubtedly a very cool timepiece and one that stays very true to the heritage it is intended to honour. 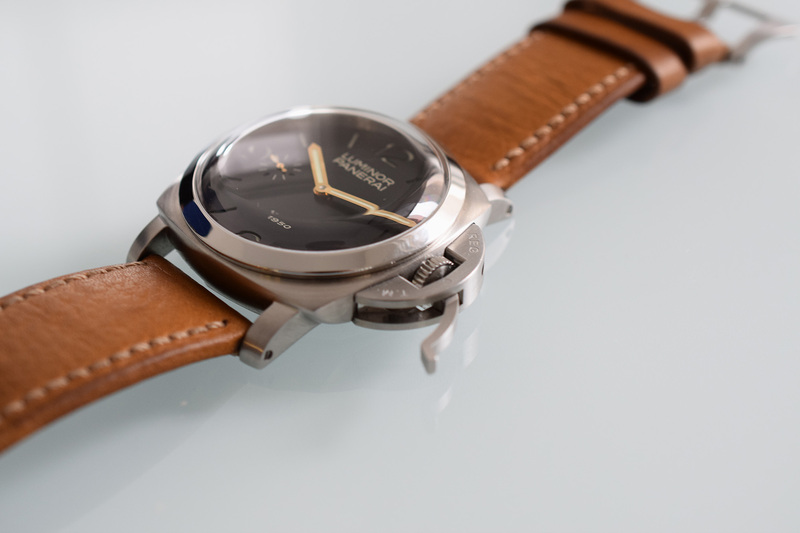 Put another way, this watch more or less exudes the brand DNA that has cultivated such a passionate following; clean lines, masculine design and of course in-your-face, impossible-to-ignore size (all 47mm of it). 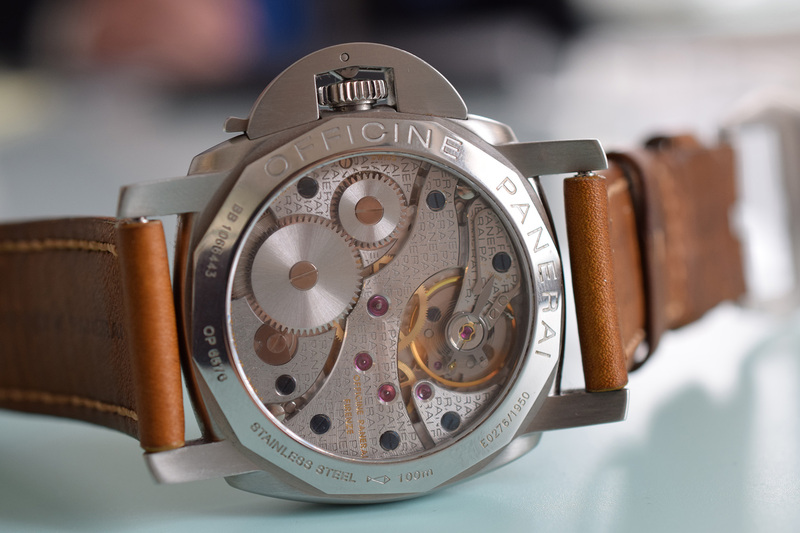 In fact pieces like this are why so many people credit Panerai with really kicking off the ‘over-sized’ watch trend, which has now become so mainstream it can’t even be referred to as a trend anymore. 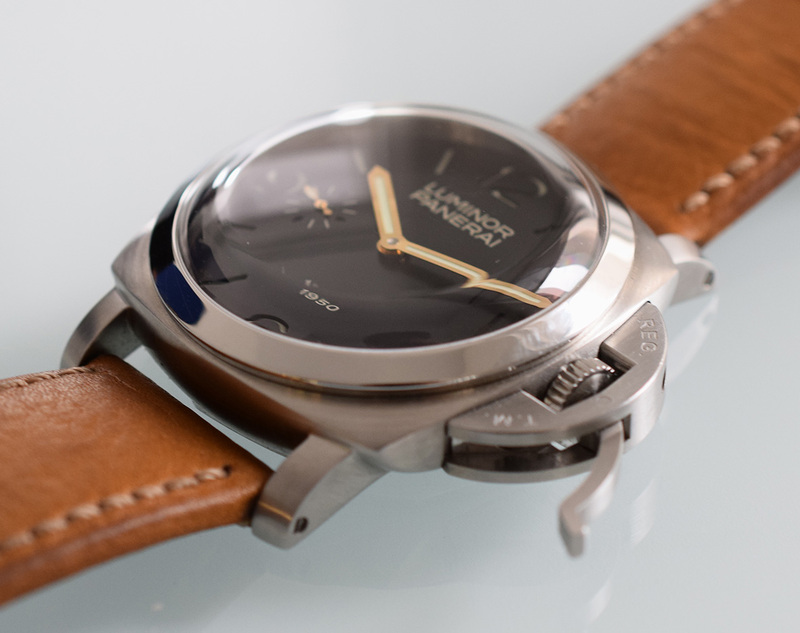 Not everyone is convinced, of course; “they’re just so plain looking though” is the comment I hear most often from my non-watch nerd friends when talking about Panerai watches in general and yet there is just something about that sandwich dial, the exaggerated curve of the sapphire crystal, the ever practical security lever lock on the crown, it’s just so practical and yet so stylish all at the same time. 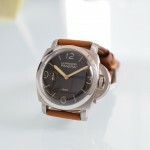 Like a good Italian suit this is a watch that was made to be worn and also to make you look damn good at the same time. It sounds silly but when you strap the PAM 127 on you just feel cooler. Of course if you do need more excitement simply turn the watch over for a birds-eye view of the heavily branded Cal. 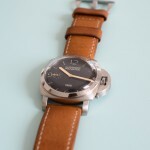 OP XI, a modified ETA movement that Panerai has stamped its mark all over. I wouldn’t go so far as to describe it as being pretty but it certainly takes the same bold approach the watchmaker has become known for. In total only 1,950 pieces of the Panerai Luminor 1950 PAM 127 Special Edition were made, which makes finding them in the second hand market just that little more difficult but also just that little more worthwhile. Happy hunting!